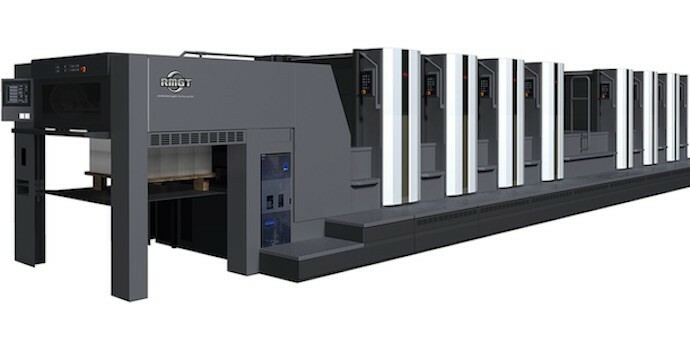 Japanese graphic technology firm RMGT is hoping that what happens in Vegas isn’t going to stay in Vegas during this year’s Print UV conference. It is using the conference to celebrate the tenth anniversary of the launch of its groundbreaking LED-UV curing technology for offset presses. RMGT is a joint venture between printing press experts Ryobi and Mitsubishi Heavy Industries Printing and Packaging Machinery. The company was the first off-set press manufacturer to offer fully integrated LED-UV curing systems as a factory installed option for sheet-fed offset presses, back in 2008. The RGMT LED-UV press is a next-generation, energy-saving, environmental-friendly LED-UV printing system, winning a “Nippon Brand Prize” at the 39th Machine Design Award competition in Japan in 2009. The innovation consumes 70% to 80% less electricity and generates much less heat than a conventional lamp system because of the use of LED technology to dry the inks. This delivers energy efficiency savings for customers, as well as greatly reducing the environmental impact of the UV printing process. The solution continues to evolve. New versions enable varnish coating and have expanded the range of value-added techniques for customers. To mark the ten-year anniversary of the innovation, RMGT plans to share customer success stories and create a buzz around its solution and LED-UV printing during the conference, which takes place this year over February 26 – 28, 2018 in Las Vegas. The Print UV Conference is the premier event for leaders in the global UV printing industry and meets annually in Las Vegas. The 2018 event will be the 11th Print UV Conference. Why Are Photobooks Sales Booming in the Digital Age?